Professor K.V. Thomas is an academician-turned politician from the state of Kerala. He is currently the Minister of State in the Ministry of Agriculture and Minister of State in the Ministry of Food and Public Distribution and Consumer Affairs, Government of India. He represents the Ernakulam Parliamentary Constituency in the 15th Lokh Sabha. Since he has over 40 years of experience in politics and association with the Congress party, he is a member of its governing body All India Congress Committee (AICC). He is also an active member and a reputed leader of trade unions that have affiliations to Indian National Congress (INC). Kuruppasserry Varkey Thomas or K.V. Thomas was born on May 10, 1946 to a Christian family in Ernakulam district of the central Kerala. His parents were Late K.D. Varkey and Late. Rose Varkey. He has two elder siblings. They are Dr. K.V. Peter and K.V. Joseph. His birthplace is a small village hamlet called Kumbalangi in the Ernakulam district of the central Kerala. Professor K.V. Thomas is married to Sherly Thomas. Their marriage was solemnized at a local church near their house on April 12, 1970. The couple has been blessed with two sons and one daughter. Since early childhood, young K.V. Thomas has been an avid listener and learner. He was put in a local government school by his parents so that he could complete his formal education. Later, he was enrolled in a government high school near his place of birth by his parents. As told before, he was a good student who took his studies seriously. He used to learn the lessons on a daily basis. Because of this attribute, he was in the good books of his teachers at the school. Along with his academics, he had also shown some interest in the school politics in his early days. During those days, he used to take part in political movements that were aimed at raising the student issues. However, his extent of participation in school politics was rather muted. Through hard work and dedication, he passed the SSLC examination with good marks and distinction. After successfully passing SSLC examination, the young K.V. Thomas enrolled himself for a pre-degree course at a reputed Junior college near his village. For his pre-degree course, he took the science stream. While he was doing his pre-degree course, he started making use of the college library to update his knowledge in Science and Mathematics. It was during this period, he started to realize his potential as a teacher, a politician and a social worker. Despite of his growing participation in political activities outside academics, K.V. Thomas could devote enough time to his studies. Thanks to his single point dedication to his studies, he could complete his pre-degree course with good grades and marks. After his pre-degree course, he realized that he had special liking and affinity for the field of Chemistry. So, he decided to take up a degree course that specializes in Chemistry. After having chosen the specialty, he decided to focus on that subject to update his knowledge. The extent of his participation in the politics of the state also increased as the years passed. However, K.V. Thomas never allowed that to come in between him and his aim of becoming a teacher. During those fruitful years, he used the college library to the maximum level possible to extract the knowledge from the books. Due to this devotion to studies, he could earn good marks and grades for his degree examinations. With the success in degree course, he mustered enough courage to take up Chemistry as the area for his higher studies. Accordingly, he joined the reputed Sacred Hearts College in the Ernakulam city to take up his Masters course in Chemistry. The financial support he was getting from his home was not sufficient to pursue his post graduate course. So, he decided to take small-time tuition classes for the students of the lower classes. He even took up teaching at local private tuition centers to generate enough money for his post graduate program. As he was busy supporting him financially, he did not participate in the political movements that were rocking the state at that point in time. Since young Thomas was busy reading books to update his knowledge, he was able to better comprehend the subject and do well in his studies. This also helped him to take classes for the students at degree level. As a result of thorough reading, his hold on the subject basics improved. Moreover, he could enjoy the subject practical well. This enabled him to complete his post graduate course successfully. After successfully completing his post graduate course in Chemistry, young K.V. Thomas took up teaching in the subject at a local college initially. During his degree and post graduate degree years, he developed good rapport with his mentors at the Sacred Hearts College. He was able to do so due to his single-point devotion to study and subject knowledge. His inquisitive mind used to ask relevant questions in the class. This enabled him to get a teacher's job in the college. Hence, he joined as a junior faculty in the Department of Chemistry. Since the beginning, the young K.V. Thomas was able to mingle well with the students in the class. He used to clear their doubts well. Through these extra efforts, he became one of the most sought-after faculties in the college. The positive feedbacks from the students enabled him to get positive appraisals from the authorities in the college. So, he was promoted to the grade of Associate Professor first and then to the grade of Professor. As a simple human being who loves teaching, he has a huge following in the student fraternity. Many of his former students are now occupying coveted posts in government, semi-government and private organizations across the globe. He served the college and the student community as a good teacher for about 33 years. He was the Head of the Department of Chemistry at the Sacred Hearts College from June 1, 1999 to May 31, 2001. After a long innings as a Chemistry teacher, he retired from the academic service as a successful faculty on May 31, 2001. Professor K.V. Thomas has been active in politics since 1970. During his long political career spanning over 40 years, he has held several important posts in the Indian National Congress. He was the president of the 7th Ward Congress Committee from 1970 to 1975. He was the Convener of Block Youth Congress in Palluruthy block from 1971 to 1980. The other posts held by him include General Secretary Cochin Taluk INTUC, member of Ernakulam DCC, Treasurer of KPCC, President of Ernakulam District Congress Committee, member of KPCC, member of Kerala State Election Congress Committee, AICC Observer to the states such as Tamil Nadu, Karnataka, Andhra Pradesh and Lakshadweep, and organizing Secretary and General Secretary of INTUC. He is also an active member of the General Council of INTUC, a trade union wing of Indian National Congress, since 1976. He first entered into the Lokh Sabha in 1984 representing Ernakulam Lokh Sabha constituency. From that point in time, he was the Member of Parliament for 12 years. From 2001 to 2004, Professor K.V. 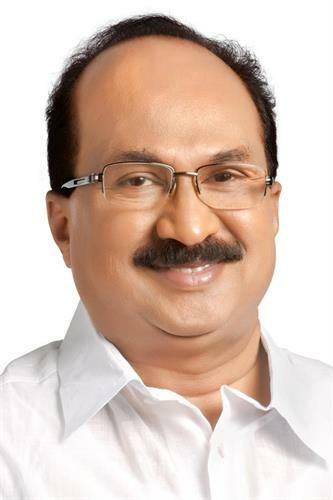 Thomas was the member of the 12th Kerala Legislative Assembly, representing Ernakulam Assembly Constituency. For a period of four years, Professor K.V. Thomas was state Minister in the state ministry. Initially, he was made the Minister in charge of Excise and Tourism departments. Later, the ministry of Excise was removed from him and the ministry of Fisheries was added to him. Currently, Professor K.V. Thomas is a Minister of State in Government of India. As a Minister of State, he holds two portfolios. One portfolio is in the Ministry of Agriculture and the other is Ministry of Food, Public Administration and Consumer Affairs. As a privileged Member of Parliament, he was a member of several parliamentary standing committees. They include Defense Consultative Committee, Civil Aviation and Tourism Consultative Committee, etc. He was also a Court Member of Jawaharlal Nehru University and Puducherry University. Other posts held by him in his long and illustrious career as a public figure include Direct Board Member of Marine Products Exports Development Authority, Working President of Indian Rare Earth Employees Congress, Director of Cochin International Airport Limited, Chairman of Indira Gandhi Co-operative Hospital, President of All Kerala Ration Dealers Association, and Member of Official Language Committee of the Kerala Legislative Assembly. Professor K.V. Thomas is a seasoned politician from the state of Kerala. He is a trained teacher who has a huge student following. Many of his students are occupying coveted posts different organizations across the globe. He started his political innings in early 1970s and gained sufficient experience working at various levels of the congress party. Initially, he was active in the youth wing of the party. Then, he moved to the trade union that has an affiliation to the Indian National Congress. Working with the youth wing and the trade union, he could prove his mentors that he had the requisite expertise in convincing the people and lead them. Because of this, he moved through the rank and file of the party and reached the zenith of his career in the public sphere. As a result, he was appointed as the General Secretary of Kerala Pradesh Congress Committee. In between, he was also fielded in Lokh Sabha elections two or three times. In all those occasions, successfully fought the general elections and secured a place at the national level of the party. He was even made the Minister of State in the central government. He managed to show his mentors that the reposing of faith in him proved them correct. He also was a member of several committees and consultative committees in the parliament.